Golden State Warriors forward Kevin Durant said it is “nonsense” for anyone who thinks that former center Greg Oden is the biggest bust in NBA history. 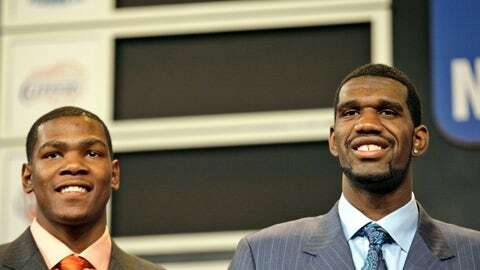 The Portland Trail Blazers selected Oden with the first overall pick in 2007. Durant was the second pick by the Seattle Supersonics. Oden did not play during his rookie season after having microfracture surgery on his right knee. In 105 games during his career, Oden averaged eight points and 6.2 rebounds a game. Durant has gone on to be a seven-time All-Star, a four-time scoring champ, made the All-NBA First Team five times and has won two Olympic gold medals. Oden last played in the NBA contract with Miami Heat during the 2013-1 season averaging 2.9 points and 2.3 rebounds in 23 games. He is currently back in achool at Ohio State University and helping out with the basketball program.